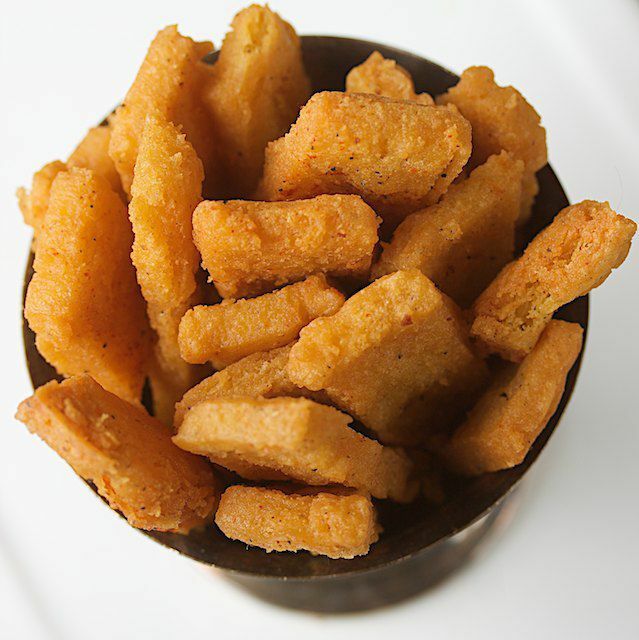 These potato free fries are flavorful and crunchy with no need for dipping sauce. They are slightly more involved than your average fry, though. First, you have to cook the batter and let it chill in the fridge until it firms up, almost like polenta. But after that, it’s smooth sailing. It’s great to make the batter and have it chilling in the fridge the night before so that you’ll have them ready to fry up the next day. Line a standard-sized baking sheet with plastic wrap or parchment paper. In a medium-sized bowl, whisk together all dry ingredients along with the minced garlic until well blended. Gradually stir in water and use a whisk to stir vigorously to remove all lumps. Pour batter into a large saucepan and cook over medium to medium-low heat. Stir continuously with a whisk ensuring that no lumps form in the batter. This will give you quite a nice workout in your arm as the mixture thickens. Embrace it. It should take about 6 minutes or so for it to thicken up, and about 8 minutes total for the batter to cook completely. If the batter begins to thicken too quickly, reduce heat slightly. Again, it is imperative you stir this batter the entire time. Don’t walk away, not even for a few minutes. Once the batter becomes thick like soft polenta or porridge, remove from heat and immediately spread onto saran wrap or parchment paper lined sheet. Spread into a rectangle so that the batter remains about 1/2 inch thick. Chill in the fridge for at least 3 hours. It is essential that the batter is chilled thoroughly, or you’ll have a hard time frying these guys up. Once the batter has firmed up a bit, bring about 1 1/2 inches of cooking oil to 360 F over medium-high heat. You can also use a deep fryer. Drop a tester piece of batter to see if oil is hot. It should begin to fry up immediately when the oil is ready to go. Use a sharp knife to cut small rectangles (or whatever shape you’d like) for the fries. Then one by one, pull back saran wrap and remove a single fry and gently drop it into the hot oil. Fry these in batches until all have been cooked. I returned my uncooked fries back into the fridge while the others were cooking to keep them cool. Cook until they are a golden brown on each side (about 4 mins or so) and place onto fabric or paper towels to absorb excess oil. Sprinkle with a touch more black pepper and chili powder. Serve alone or with your favorite dippin’ sauce.